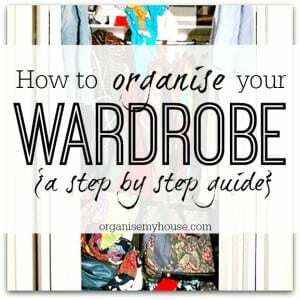 This is the first of a series of posts about how to get your wardrobe properly organised once and for all. After all, learning how to organise your wardrobe can save you so much time and energy on a day to day basis, and who wouldn’t want that! We all have to get dressed every day, sometimes more than once for different activities – no wonder that without a system in place things can easily get messed up very quickly. So – let’s get started shall we!. As always, I am going to tackle this organising task using the A.D.O.R.E method – taking it one step at a time, so you don’t feel so overwhelmed, and so you can also manage your time a little more – as you can take each section at your own pace. I hope you enjoy this series, and I would love to hear how you get on with your own wardrobe organising project – here’s to being able to find what you want, when you want it, and dressing so you feel great every day from now on. When it comes to your wardrobe, there are a few common things that I’ve heard (and said) so many times, that you are bound to resonate with at least one – this will usually be the reason you want to get the space more organised, and you want to identify the reason so that you have more motivation to get it done. My …. is in the wash! …. 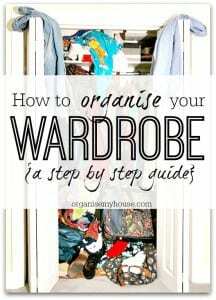 They are all common complaints heard in most homes daily, and the main problem with wardrobe organising (or lack of it) is being able to find what you need, when you need it, and it being clean and ready to wear as well. Once you know why you want to get your wardrobe organised, keep this in mind going forward to give you that momentum…. It helps to get your wardrobe (or chest of drawers for that matter) completely empty when you get started, as you can then see exactly what you have in terms of clothes and also space for storing clothes once they go back in. You will find it almost impossible to sort through things if you only take one thing out at a time – this is the time for a clean slate – to really make a positive change, so why not GO FOR IT! Miss this step out and you miss a trick. If you have plenty of space, then you may be able to house all of your clothes back in the space but in an organised way, or you may have to think about storing some items elsewhere. When you know what space you have, you can make decisions about how best to organise your wardrobe, and what would work for you. Pick up each item of clothing and make a decision about it there and then – don’t procrastinate or this is the step that will overwhelm you and you won’t get any further. GIVEAWAY – either to friends, Freecycle, supermarket recycling bins etc.. Exceptions to the rule – If you are currently pregnant, then you can of course keep clothes that don’t fit – as you will be fitting them in a few months. You are keeping something because you love it and are waiting for it to come back into fashion – chances are that by the time it does come into fashion, either it will not fit you, or your tastes will have changed, or you will simply want to get some new clothes rather than reuse your old ones. If you are currently losing weight, don’t be tempted to say that you will keep different sized clothes just for now – your subconscious will know that you have a get out clause in your wardrobe if you put weight on again, and if it takes a while to lose the weight, you may have changed your mind over what you will want to wear when you get there (you may also prefer to treat yourself as you go as an incentive). Up until now you have simply been going through your clothes and sorting them into categories. Now it’s time to start to take some things away and deal with each category in turn. Ignore the first 3 categories for the time being, as these are items that you want to keep and that don’t need any actions – so they are all clothes that you will need to put back into an organised way later on. For this step, you are purely wanting to take away anything that’s not staying in your home, and deal with any necessary actions. This will make things much less overwhelming, and create some much needed space to carry on with the process. Bag up all these items and decide on where you want to donate them. Sometimes if you are finding it hard to say goodbye to your clothes it can help to donate them to a charity that’s close to your heart. The next step is to work out when you will be going to that charity shop in the near future, so either do it right now, or make a note in your diary to take these bags when you are next in the area – and then move the bags to somewhere out of the way (I like to have them in my car boot as then they are there ready when I next pass the charity shop). As with the charity pile, you want to work out where these items are going, and make a plan to get them out of the house and into the right place as soon as you can. If you are going to sell your clothes on Ebay or similar – consider whether you have the time and energy to list them, manage the auction, and post the items. Yes, you may be able to make some money from selling the items on, but how much is your time worth doing so? As soon as you can, take all rubbish items to the tip or put in your dustbin if you have the space. Getting them out of the house asap is the key. Your KEEP-TO ACTION pile of clothes are no good to anyone until they have been actioned. Think about those times when you have gone to your wardrobe and pulled something out that’s got a stain on it, or is damaged and needs mending, or that simply doesn’t fit and needs altering. Actually getting these actions done means that you will open your wardrobe and be able to wear anything in it – and that would be a great feeling as I’m sure you’ll agree! This is a great stage to get these actions done, as you are also dealing with the items to take out of the house in your rubbish/charity and recycling piles, so you could always make a journey around your town dropping off items at the dry cleaners, tip etc… all at the same time. TIP – once the clothes to be actioned come back to you, they can either be put into one of the last 3 piles (the KEEP piles), or you can immediately put them into your newly organised space – it depends on how long the actions take. For now, just get the ball rolling and get those actions done. So, you have now looked at the space you have, gone through each item of clothing and made a decision about what category it belongs in, got all items out of the house that you are not planning to keep, and actioned any items that need something done to them to start wearing them again – give yourself a pat on the back for a job well done! You have finished the sorting and decluttering stages of the process, and should be feeling a lot lighter (usually quite a lot of clothes have been taken away at this stage, and you can start seeing what you really want to keep much more clearly). Now it’s time to tackle organising what you have left…. CLICK HERE to go to the next part of this series….. I like to have my wardrobe organized, although it is a very difficult task. I love the way you’ve broken it down in to steps and sub-steps… so easy to follow! Thanks Janet – glad you like it! this article is so helpful and superb . Thankyou so much and God bless you !! Following on from this post, please can you advise how and where things are best stored. I have a double hanging space in a wardrobe and tall boy / chest of drawers alongside this. Coats tend to get hung in the spare wardrobe in our guest room. and jackets,jeans, joggers and sweat cardigans/ fleeces. If hanging those- tops above and bottoms below – or by type – going out to everyday ? Is it better to store out of season clothes in the spare room or under the bed ? Many thanks for any ideas on this. Thanks for the questions – I aim to do some posts on clothes storage this month so watch this space – but for now what I would say is that you need to work with the space you have, everyones different. If you have enough hanging space then hang your clothes up as much as possible as they get creased less – or if not then storing tshirts so you can see each one when you open the drawer is a great way to go (I will do a post on this for the visual!). Hang clothes as you prefer to get ready – so you may choose by type (shirts, trousers, skirts etc..), by colour, by genre (going out, casual) or a mix of these. I always store out of season clothes in my storage bed as it keeps everything in the same room (useful if the weather changes and you have guests staying in the other bedroom), but it keeps them all out of the way. Very good post and a greatest part is the arrangement using hangers. This one helps you to find the appropriate clothing and thereby saving a huge deal of time while locating them. Thank you for all these tips. I really need help ion de-cluttering my closet because I am running out of patience as to how I should do it. I have tendency to purchase things that I do not eventually use so I guess I have lots of clothes to give away. Thank you again for this post. this is a fabulous post, you have gone into great detail with everything and it has been very helpful for me and i am sure countless others. Thanks for such a lovely message – really pleased it has helped you!